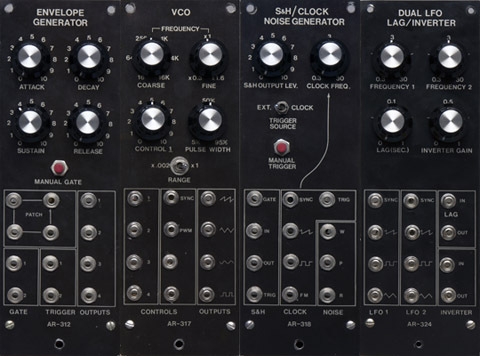 I'm repairing four Aries Modules for a fellow synth enthusiast and thought I'd put together some Aries pages with photos, schematics, and scope images on my website. You don't see too much information on Aries so I thought I would post my learnings. The first learning is that these were kits and so were not built correct to begin with. I have been unable to find any PCB layout information and some parts are placed pretty random on the PCB so troubleshooting is slow. I had a system and an old friend, Robert Leiner, has always used a largeish system and anyone who knows his music will appreciate the quality of his sounds... Excellent stuff. Nicely laid out systems and I liked how it sounded. If one turned up I'd buy it. They were always affordable. These days I guess they would go for more than I'd pay though. Thanks for posting the info Dave! I drooled over those Aries systems back in the late 70's. Finally found a system that was built then stored for 30 years. Put it in a proper walnut cab. I'll have to post some samples/vids. The only module I would like to add is the original AR-314 filter. Not sure if all modules are there but it's a lot of stuff. I can try and dig out what you might need. I recall getting a couple of Aries VCOs in the seventies and putting them behind a different panel. Must of been able to get them without the panels, or we tossed the panels. I distinctly remember part of the circuit being potted, so I wasn't able to completely reverse engineer it by drawing the schematic. This is really interesting stuff. You can see how heavily the Wiard 300 series is influence by these modules. Even the coding is similar. I would greatly appreciate anything on the 317 and 318 as I haven't yet started to work on those. I would also appreciate information on the 312 and 324 to complete those web pages. I'd be happy to host any Aries scanned information as long as it's a reasonable size. I have a fair amount of webspace left. I could host them in the interim if someone else wants to host it later or I can build an Aries section of my web. My email can be found on my home page. i built a few date accurate clones of the aries low pass filter last year... sounded beautiful. i hope to make a few more aries modules for my next system. 'visions of the past' has some really amazingly melancholic parts in it. Talking of which, this seems to work as a reverse engineer of the generic potted module-I've breadboarded a clone of the AR314 filter and this does the job just fine using a 3904 and a couple of 3906s (please excuse my crappy drafting skills). Seriously, I can see that. It's got depth to it and emotion. A GREAT album. 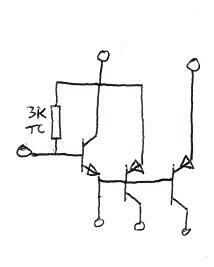 I had come up with the same schematic for the expo converter by analysis of the schematic. When you turn the PCB over and look at the trace patterns the circuit is pretty clear. Thanks for confirming the circuit and prototype. I put schematics and rear PCB images on my site. I've finished up the AR-312 EG, AR-318 S&H, and the AR324 Dual LFO. I've updated all those pages with scope images, modifications, and measurements. I've just started working on the AR-317 and have the core running. There is no voltage control but I'm thinking (hoping) the expo converter must be OK since it is sourcing current to both circuits. The circuits are all pretty straightforward but tracing them with all the jumble of wires to the rear connector is a pain. Ok, now I need help. It is the expo converter that is bad. 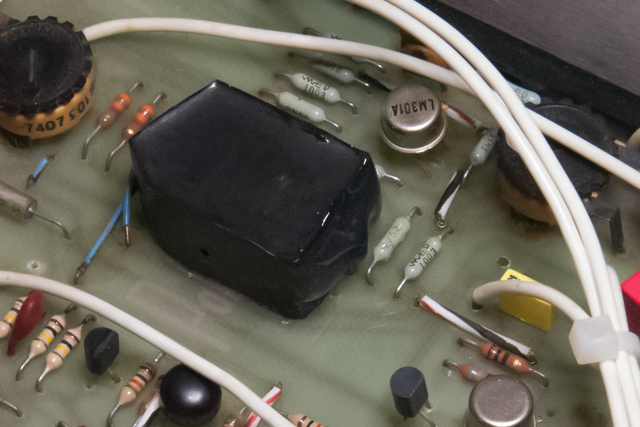 I think it's just the first NPN transistor. The trouble is I can't get the module off the PCB. I have wicked all the solder and every pin is loose. I'm thinking they soldered these parts in, put a form around it, and potted it on and to the PCB. Does anyone know how the potted module was installed? I hate to cut the runs and put an expo converter on the back. Seems like a lot of hacking, but I don't see any other way. Suggestions? 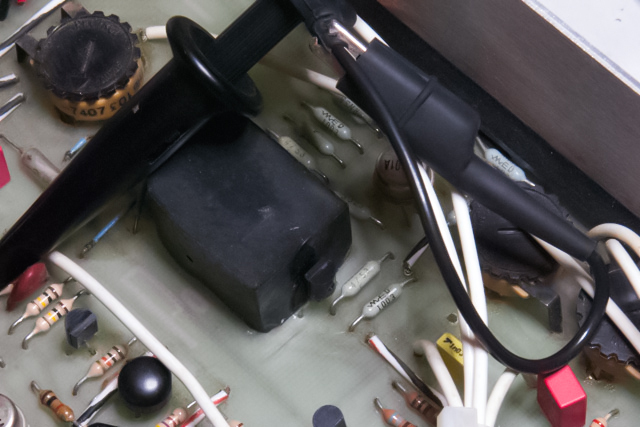 As soon as I saw your photo of the underside of the potted-module I had a horrible feeling that they had done the potted module ghetto-style by just epoxying around the board components. Thanks much. That confirms my suspicion. I think there is nearly 1 in sq of potting to the PCB. This is never going to come off. I did confirm it is only the NPN that is bad, so I think I will just epoxy one to the side with the tempco. I think that should work fine. Thanks for the tip on the linear FM. I did epoxy a NPN to the side of U8. I drilled three small holes in the PCB and fit the transistor in such a way that all three leads simply bent and soldered to their respective traces. It came out pretty good and the VCO doesn't drift over several hours. This was the last module to repair so I've put new photos and scope images on the AR-317 page and updated the other pages.